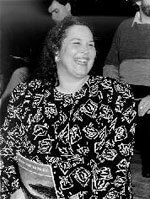 Elizabeth Connell, who died in February 2012, was recognised as one of the world’s leading dramatic sopranos. Following her debut at Wexford Opera Festival in 1972 she sang at the opening of the Sydney Opera House in War and Peace in 1973 and continued to have a special relationship with Opera Australia ever since. Following a five-year association with English National Opera she became a freelance artist with the major opera houses. She appeared at the opera houses of London, Paris, Vienna, Berlin, Munich, Hamburg, New York (Metropolitan Opera), San Francisco, Milan (La Scala), Naples and Geneva in a wide repertoire including Lohengrin, Tannhäuser, Der fliegende Holländer, Tristan und Isolde, the 'Ring', Elektra, Ariadne, Nabucco, Macbeth, Attila, Don Carlos, Fidelio, Jenufa and Peter Grimes. She had a successful collaboration with conductors such as Abbado, Muti, Sinopoli, Giulini, Sawallisch, Mackerras, Downes, Sir Colin Davis, Maazel, Levine, Ozawa and Elder. She sang at the Bayreuth (Lohengrin, Tristan and Der fliegende Holländer), Salzburg (Idomeneo and Elektra), Orange (Elektra and Nabucco), Verona (Norma and Nabucco) and Glyndebourne (Idomeneo) Festivals. In concert her performances included Beethoven’s Ninth Symphony in London with Claudio Abbado, Missa Solemnis in Florence with Carlo Maria Giulini and Mahler’s Eighth Symphony with Maazel, Sinopoli and Boulez. In recital she appeared with Geoffrey Parsons, Graham Johnson, Eugene Asti and Lamar Crowsen in Milan, Geneva, Sydney, Johannesburg and at the Wigmore Hall. She sang Strauss Vier Letzte Lieder with the London Philharmonic Orchestra and Jonathan Nott and with the West Australian Symphony Orchestra under Matthias Bamert. Her many recordings include Rossini's Guillaume Tell (Decca/Chailly), Mahler's Eighth Symphony (EMI/Tennstedt), Mendelssohn's Second Symphony (DG/Abbado), Franz Schreker's Die Gezeichneten (Decca/Zagrosek), Donizetti's Poliuto, Verdi's I Due Foscari (Philips/Gardelli), Schönberg's Gurrelieder (Denon/Inbal), Wagner's Lohengrin (Philips/Friedrich) and Schubert Lieder with Graham Johnson, as part of Hyperion’s Complete Schubert Edition.